Based upon the findings of the feasibility study „Innovative Capital Region” the aim was to set up a Berlin Innovation Panel. For that task the Chair of Innovation Economics entrusted the Centre for European Economic Research in Mannheim to determine the innovation behavior of companies in Berlin within the framework of the nationwide innovation survey 2012 (see result here). Meanwhile, the seventh survey funded by the Technologiestiftung Berlin has been completed. The results can be found here. 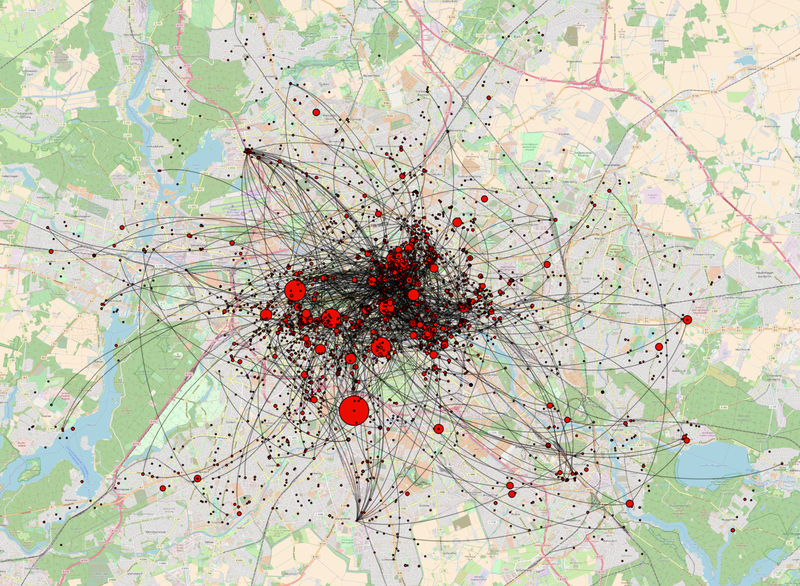 Wirtschaftswoche reported about the microgeography of innovation in Berlin based on the previous five surveys. 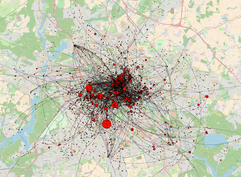 Recently, Kinne and Axenbach (2018) display a network of more than 3,700 interconnected software firms based in Berlin. The size of the bubbles represent the level of companies’ interconnectedness. They have extracted information from firm websites using web scraping and data mining. Since the majority of companies in the IT sector and almost all companies with more than 25 employees have a webpage, the presented picture includes almost the universe of Berlin software companies. The more than 700 linkages are based on the hyperlinks, they found on the companies’ homepages. 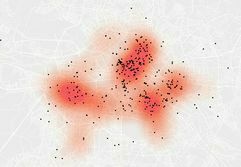 Finally, comparing the network with the innovation hotspots above reveals some similarity, but obviously also some differences, which will be investigated in future research. This figure from K. Moellers article "Culturally clustered or in the cloud? 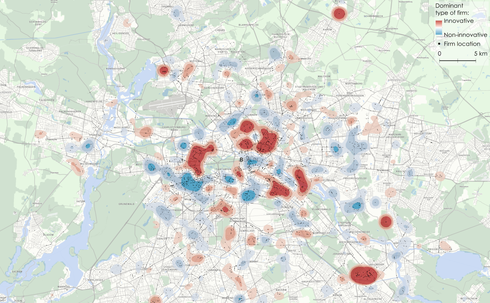 How amenities drive firm location decision in Berlin" shows the distribution of start ups and consumption amenities. For further information klick here. The Berlin Innovation Panel (BIP) is embedded in the Mannheim Innovation Panel (MIP). The MIP provides important information about the launching of new products, services and processes in companies, the expenditures for innovation and the success companies have with their new products, new services and new processes. More information regarding the MIP can be found here. The Centre for European Economic Research provides information about the project here. Students who would like to write their theses related to this subject please contact Prof. Knut Blind.